King Cashalot has been considered the most popular ruler in all the lands for a very long time. Click here to play! The reason is quite simple. He has a strict monetary policy based on everything being made of gold. This is maintained through force of arms, sure, but marauding knights are something for other kingdoms to worry about. The subjects of King Cashalot just enjoy the spoils, not the pesky casualties. The kingdom is so rich that even the dragons are made of gold! At the moment, the King's knights are trying out gold armor, though they have admittedly been meeting with defeat a lot more often since they started donning golden helmets against maces and halberds. Actually, it would seem that King Cashalot's reign may come to a swift and violent end if his knights keep losing their battles the way they have been doing lately. Oh well, better make the most of the King's legendary buffets while they last. A few more serves of trifle, fish, shrimp, ham, and roast turkey, and then you'd best be on the road away from King Cashalot's kingdom - just be sure to grab a few golden trinkets before you leave. The Jester symbol is the scatter symbol, and pays out on the total bet when enough symbols land on the reels. The King symbol is wild in this game, substituting for any symbol other than the scatter symbol. 5 on the same payline will also trigger the progressive jackpot. There is a gamble feature that allows players to wager on-reel wins. Players then try to guess the color or suit of a playing card, with a correct guess of color doubling the stake, and a correct guess of suit quadrupling the stake. An incorrect guess loses the stake. Also, when 3 or more Dragons appear scattered on the reels, the treasure bonus is triggered. 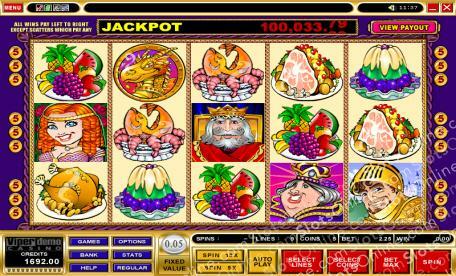 In this game, the player is awarded a random bonus amount.